The Archers of Caledon provides archery instruction for both the beginning and experienced archer. Group lessons are conducted by coaches certified by the National Coaching Certification Program (NCCP). Participants must be at least 12 years of age and of average strength to be able to draw the school bows and benefit from a multi-student training setting. Parents or guardians of youth participants under the age of 18 are required to stay at the club for the duration of the lesson. Younger students can be accommodated, on an individual basis, through private lessons. All equipment is provided by the club, and no previous experience is required. 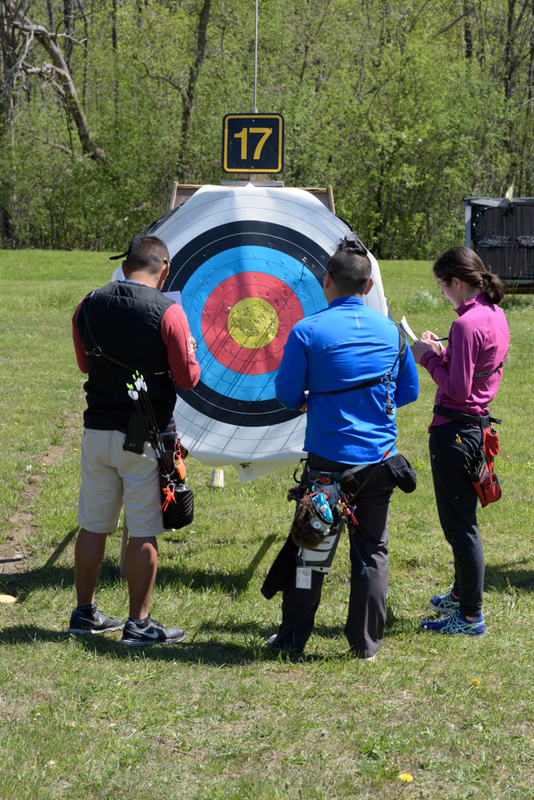 Interested in archery but not sure if our regular lesson programs are right for you? Come out and try our Single Intro Archery Lessons. Book now, space is limited! Group Lessons are held on Saturday mornings from 9:30 AM to 11:00 AM, (see schedule for start dates). In addition, participants are able to use the Club range on Thursday evenings from 7:00 PM to 8:30 PM for practice. The cost is $125 + HST per session, each session consists of a 5 week period. Advanced registration is required. Class size is limited to 10 students and the student/coach ratio is 3:1. Private lessons can be arranged on an individual basis subject to availability of coaches. Archery is one of the fastest growing family recreation sports. Start your enjoyment of the sport with proper instruction.Our schedules for training have always been fully booked months in advance, therefore, we encourage you to register early. The Archers of Caledon now provides extra coaching services to develop skills beyond the basic and advanced lessons. Group coaching is also available for business and community organizations. Visit our coaching page for more information or see the schedule links below. Archers who have completed the Beginner 2/3 class and achieved the Can-Bow score necessary (200 at 15m) to shoot from the 18m line (or equivalent). Archers with their own equipment wanting to shoot outdoors and have sufficient draw weight to reach 40m. learn basic equipment preparation & bow tuning. learn how to score in a group with multiple scorecards. prepare for an outdoor event in a variety of weather conditions. participate in a T2S (train to shoot) tournament (additional fee required). have their own equipment capable of reaching 40m (bow & arrows minimum; bow stand & quiver preferred). be comfortable outside in all weather conditions (sun, wind, rain, mud, puddles, .. ). have completed our Advanced Beginner (Beginner 2/3) course or equivalent. bring a pen and small notebook (ideally, it will fit in your quiver or pants pocket). Parents or guardians of youth participants under the age of 18 are required to stay at the club for the duration of the lesson. As this is an outdoor course, all participants are encouraged to check the weather forecast and dress appropriately. The cost is $125 + HST and advanced registration is required. The class size is limited to 10 students. Spaces are limited and will be filled on a first-come-first-served basis upon receipt of completed registration form and registration fee of $125 + HST. Club equipment is free to use at the club. Check lesson availability using the online registration system by clicking the corresponding button below. SIGN UP FOR BEGINNER CLASSES TODAY!